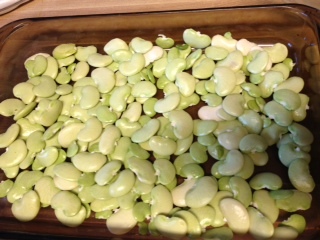 If you are like me, you grew up cringing every time you saw lima beans – those yucky, mushy, stinky lima beans. Never would I eat them, no way, no how. I’d rather lock myself in the bathroom! 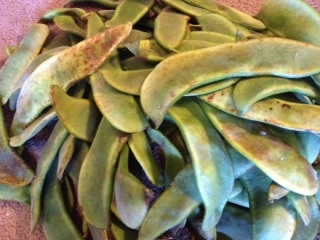 When I moved to Delaware, where they grow lima beans, people would actually look forward to the harvest and pay a premium for fresh pole limas. What?! Were these people crazy? It took me about 15 years of living here before I would try cooked fresh limas. Once I did, I wondered what took me so long! 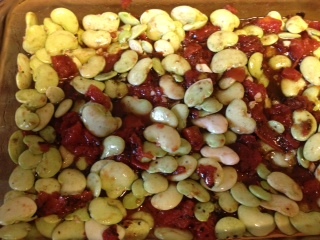 Still, I think the preparation is the key, these are fresh beans, so I don’t boil them, I don’t turn them to mush. I bake them, with tomatoes and olive oil and seasoning. Very simple, but very rich in flavor. 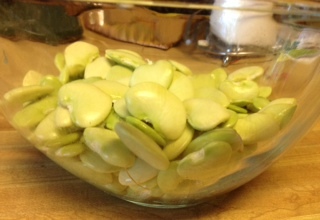 I grew my own limas last year, that was a lot of fun, but the harvest was a lot of work. I tried again this year, but the beans never germinated. So I had to buy beans. I bought about a half gallon basket, which yielded about a pound of beans, maybe a bit more. I made them as a side dish to my cornflake crumb chicken tenders (look for the recipe for that in a few days). 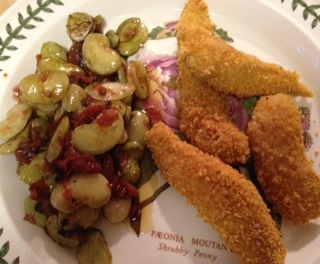 So it was kind of a retro-themed dinner – my modern version of a 1950’s lima bean and chicken cutlet dinner. 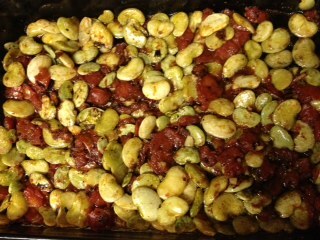 Spread the lima beans in a 9 x 13 baking dish. Add the tomatoes, oil, garlic, and salt. Stir to mix. Bake, uncovered, for 40 minutes, stirring occasionally. Remove from the oven, and enjoy! I’ve always liked limas, but I bet they are 100 times better fresh. This dish looks delicious! The difference is amazing. 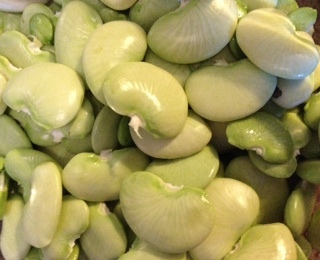 If you don’t have access to fresh limas, this can also be made with dried beans. First you soak and simmer them. You need to use a little more oil and cook the dish for longer, probably 1 to 1 1/2 hours.